Choices - good or bad - all have consequences. The ripple effects of one choice - and its resulting consequences - can impact the lives of numerous individuals. 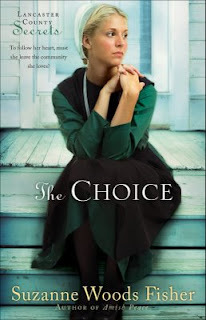 Choices people make are the center of Suzanne Woods Fisher's first Amish novel, The Choice. Set in the midst of an Amish community, Fisher's work examines the lives of Sol Reich, a young Amish man who wants to play baseball - at the risk of losing his entire family; Carrie Weaver, a woman who wants to be with the man she loves, but wants to protect her younger brother; and Daniel Miller, a man who wants to find a way to move beyond a very painful past. "Almost every character is coping with decisions they’ve made, or how they’ve responded to circumstances," Fisher said. "I felt that God never gave up on anyone in the story. He just gently surrounded an individual who was hurting. To me, that’s how God acts. Far less judgmental and far more loving than we give Him credit for. "What none of [the main characters] ever dream possible is that the truth, brought into their lives by an innocent man serving time in prison would forever change their future." While it is a novel, Fisher said there are some "true to life" threads running through The Choice. "As I was writing the story, there were some tragic events of contaminated kerosene tanks blowing up and killing some Amish individuals," Fisher said. "The reason I chose baseball was because I drove by many Amish schoolhouses in Pennsylvania and saw Amish boys playing softball. "During the same trip, I kept bumping into signage for the Lancaster Barnstormers. That’s how the story begins…as a baseball scout spots an Amish young man who throws a mean fast pitch." In addition to the main characters, facing life-changing choices, Fisher also weaves into the storyline, Mattie, a strong minor character who she hopes serves as a positive role model for readers. "She was so solid," Fisher said. "She never wavered in her ability to be a faithful friend to Carrie, even when feelings for Sol came between them. I liked what Mattie modeled for other girls. We have plenty of bad examples in books and TV; we need more good examples." Fisher wrote about the Amish because of her family connections to the Old Order German Baptist Brethren - also known as the Dunkards. Her grandfather, W.D. Benedict, was raised Plain, a close cousin to the Amish. "I've always had an interest in my Dunkard relatives and the reason behind their lifestyle," Fisher said. She believes many readers have a similar fascination with the Amish's plain lifestyle, because of the simplicity of their lifestyle choices. "There’s a direct correlation between how complicated our lives are—with all kinds of time-saving technology that oddly consumes time—and peoples’ longing for a simpler life," she said. "It seems as if people are hungry for margin in their lives—for leisure time, for fewer demands, for quiet, for peace. "I’m not sure life ever has been simple, but there’s a perception that a rural, less materialistic life is more manageable. And who better personifies the simple life than the Amish?" For the most part, being Amish means that a person is born into the community of faith. "Very few people ever convert to the Old Order Amish," explained Fisher. "Being Amish is both a Christian religion and way of life that affirms their beliefs"
Those beliefs include the familiar: living a simple, non-materialistic life which include the rejection of electricity from public utility lines, a distinctive dress, a prohibition against television and computers and using a horse and buggy as the primary means of transportation. Those living the Plain or Amish lifestyle also practice ending education at the eighth grade and meeting in homes for church. Throughout all of her writings based upon the Amish faith, Fisher has tried to reflect the people she met during her research: well educated people with a deep and abiding faith. "But there’s so much more to the Amish than the buggies and the beards," Fisher said. "The Amish are the first to say they’re not perfect people, but I do believe they have a tighter grasp on some important values that we could all benefit from observing." The non-Amish or English definitely have some assumptions about the Amish, including legalism. "But I have to say that the Amish people I met and have kept in touch with aren’t legalistic," Fisher said. "Yes, they do pay careful attention to tradition, and they highly value it, but I feel it has to do with honoring God. I think we emphasize different aspects of our faith." For example, Fisher continued, the Amish do not evangelize. Instead, they believe their lives should speak as a silent example to others. "Many get stuck on that point of non-evangelizing, and yet, look at how the world was touched by the Amish example of forgiveness over the Nickel Mines School Shooting," Fisher said. "Now consider this, most Protestant churches do not emphasize confession of sins. "The Amish hold communion twice a year and one of their practices - prior to communion - is to admonish everyone to make amends with others so that they accept communion with a unified spirit. In other words, church members are encouraged to keep short accounts and resolve grudges. I’m sure there are Amish who accept communion while still holding a grudge, for example, but the high bar is a wonderful model. Feelings follow intention." Fisher said she truly believes the Amish are, at their best, close to the heart of Christ. "They love The Lord’s Prayer and the Sermon on the Mount," Fisher explained. "They desire to live as Christ would have them live—to put aside pride, to practice forgiveness on a daily basis, to avoid materialism and look to putting treasures in Heaven. "There are so many principles, like those, that the Amish live out and ones we could (we should be!) incorporating into our lives. On a very practical level—even their uses of energy. They use all kinds of sources of energy: wind, sun, propane, kerosene, solar panels and cells, battery packs. I have a feeling we may all we living more like them in the near future." Much of Fisher's knowledge of the Amish faith comes from immersing herself into the culture through studying its newspapers like The Budget, learning about its theology and developing relationships with its members. She created the storyline based upon the close relationships that the Amish have not only with their immediate family, but also their extended, extended family. "A few people have complained that too many people died in The Choice—a fair critique, but I was actually trying to create a realistic look at the Amish community," explained Fisher. "When a circle extends so wide, these tragic events do happen! "The Amish keep track of each other—aunts and uncles, distant cousins, grandparents, etc. It’s amazing to read the letters in The Budget and see how many accidents/illnesses occur. They genuinely care for each other through the tragedies." Fisher's desire to write began when she first learned to read. She later turned that desire into a career as a magazine writer. "I have always loved reading and writing, and yet I was never identified as having any talent as a writer," she said. "Still, I persevered out of a passion for the written word." "I assumed I was a non-fiction writer," she said. "As I ventured into fiction, I wondered why I had limited myself! My non-fiction writing has improved because of writing fiction—I’ve learned to jazz it up. And my fiction writing has an edge because I have research skills to give it credibility. I really think writers should be open to stretching their vocal chords!" The visits to Old Order Amish homes, as well as interviews with Amish experts became the foundation not only for her first book, but also the foundation for this new series of fiction books. "I wrote from what I observed and learned; many story lines come from the families I met," Fisher said. "Because of that, I hope my books are very credible. "The amount of research required for a non-fiction title is time-consuming, yet so critical to its credibility. I went back to every person I interviewed to have them review the story for accuracy (including every Amish person…and the Amish don’t have e-mail and they aren’t in a hurry. It was a slow process!). Fiction can move a little faster and with a little more freedom for the storyline." "I [love] writing for the Christian market, I feel God has opened the doors for me to have a venue, and I am so over-the-moon grateful that I want to honor Him in every word I write," Fisher said. "The 'writing gig' isn’t easy, a lot of rejection, a lot of self-doubt and it’s difficult to become a public person. You’re 'exposed.' I described it once as feeling as if I’m standing in front of the world in my underwear! "One thing I’ve learned is that God is with me 'in the process,' in each book contract, each public speaking event [and] each interaction with readers. No detail is too small," Fisher said. Fisher hopes people who her books feel closer to God at the conclusion of the story. "I never want to whack someone on the head with faith," Fisher said. "I just want to encourage a reader to trust God a little more, rely on Him a little deeper and get to know Him in a fresh way. "I believe that only the Holy Spirit can touch a heart. I want my writing to be an example to others to seek faith, and I always hope to honor God with my work. But my role is to be winsome; God’s role is in the heart-changing business." One of the best things about writing, explained Fisher, is how it allows her to connect with people throughout the world. "I love, love, love hearing from readers and developing e-mail/Facebook relationships with them," she said. "I like to pray for others and take that privilege seriously, and I enjoy encouraging aspiring writers to develop their craft. "Lately, I’ve had a few connections that I feel are heaven-sent. A couple of people who have a loved one afflicted with Alzheimer's disease, in particular (my dad has AD). Sometimes I think…if that’s the reason I am writing, to help that one person in her journey, it would be worth it!" She said meeting people through the various social medias has been "a surprisingly delightful experience." "There are so many kind, generous, interesting people out there," Fisher continued. "I used to view a blog as “piano scales”…exercises for daily writing. Now, I feel as if I’m keeping up with my friends." There are three books in the Lancaster County Secrets series. The second in this series is called The Waiting, and it is set for an Oct. 1, 2010 release. The book also takes place in Stoney Ridge, Penn., but during the 1960s. Jorie King is in love with Ben Zook—a fellow who has a tendency toward “fence jumping” and is currently serving in Vietnam as a conscientious objector. "Everyone assumes Jorie will marry Ben when he returns, but life in Stoney Ridge takes a few unexpected twists and turns," Fisher said. The third book is written but hasn’t been officially titled yet. It will release Jan. 1, 2011. Fisher just signed a contract with Revell for another three-book Amish fiction series, based on the lives of three sisters. (Each sister will take turns as a main character). One of the things I liked about Fisher's novel is that the characters seem believable - sometimes more so than other Amish novels on the market today. Fisher said she is very deliberate about making her characters "realistic" for readers. "Some of it comes from giving characters flaws, so that they become believable," Fisher explained. "Readers can identify with a character when he/she isn’t perfect." One of those realistic characters is Steelhead, who unexpectedly appears in the novel and shows his faith in a non-conventional, raw and emotional way. "I don’t know if there could really be a guy like Steelhead, swooping in and falling in love with an Amish spinster," Fisher said. "I guess that’s where fiction steps in! But the reason I wrote that sub-plot was for contrast and surprise. Emma seemed so boxed up, so attached to rules, yet she dearly wanted to love and be loved. Carrie was so on the fence about so many things in life, yet her greatest need wasn’t love, it was finding herself." I also found that Fisher's background, gives her book an air of credibility. She's not just writing about a culture that is unfamiliar. She has lived and breathed this world - through her research and her family. If you like Amish fiction, I believe you will love this novel. Join Suzanne for Author Talk, a LIVE Chat, on Monday, Feb. 15, at 8 p.m., EST! She's wrapping up the launch for The Choice and month long blog tour (http://www.litfusegroup.com/Blog-Tours/blog-tour-for-the-choice-by-suzanne-woods-fisher.html) with an evening of chatter and fun. Suzanne Woods Fisher's interest in the Anabaptist cultures can be directly traced to her grandfather, W. D. Benedict, who was raised in the Dunkard Brethren Church in Lancaster County, Pennsylvania. Benedict eventually became publisher of Christianity Today magazine. Suzanne's work has appeared in many magazines, including Today's Christian Woman, Worldwide Challenge, ParentLife, Christian Parenting Today, and Marriage Partnership. She has contributed to several nonfiction books and is the author of Amish Peace and two novels. Fisher resides in Alamo, California. The Choice is available now through Revell, a division of Baker Publishing Group. Revell offers practical books that bring the Christian faith to everyday life. They publish resources from a variety of well-known brands and authors, including their partnership with MOPS (Mothers of Preschoolers) and Hungry Planet.